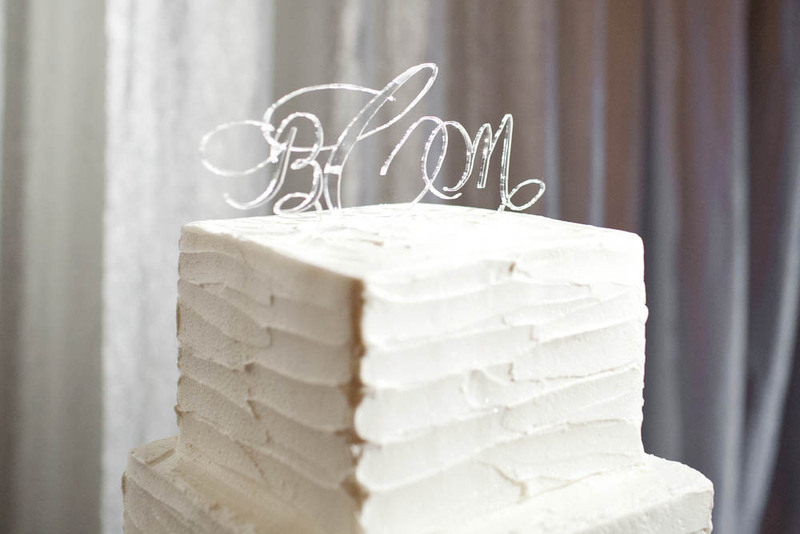 And the top of the cake with the custom laser cut monogrammed cake topper with the new couple’s monogram. Finally, they did give out delicious cookies to all guests and were sitting on the tables. 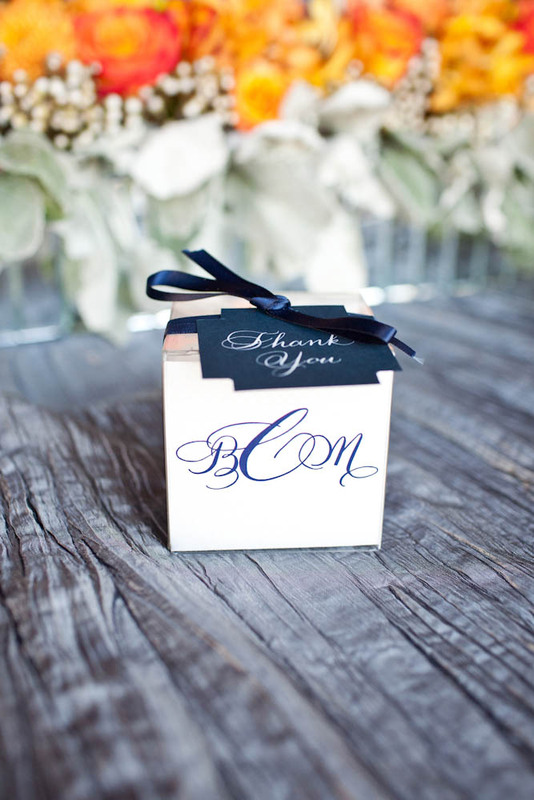 Each box had a thank you tag and custom packaging with the new monogram and flavors. 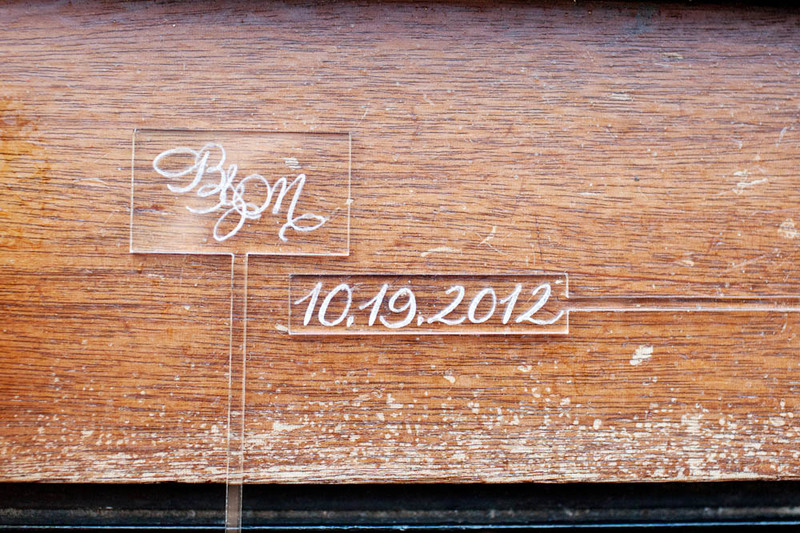 It’s not often ballroom wedding calligraphy is featured on the blogs. 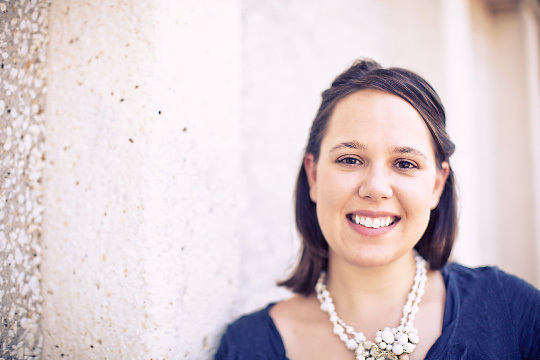 I’m thrilled to share something personal here. 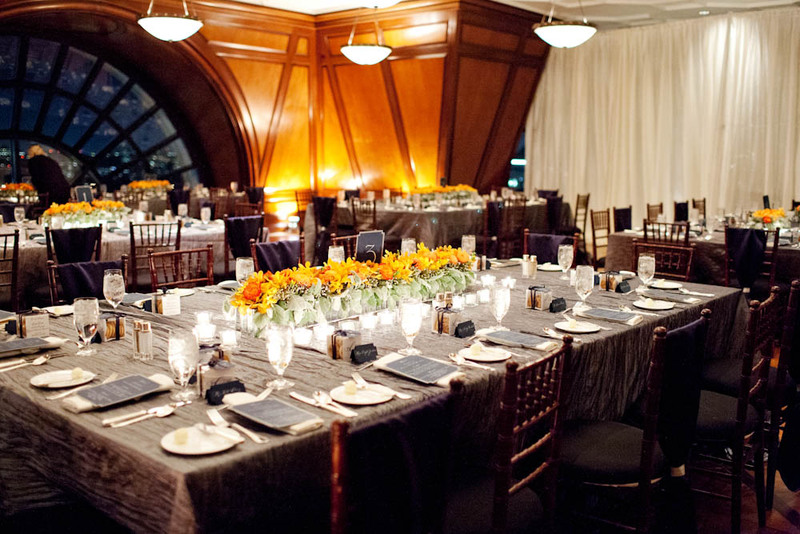 My sister hosted a lovely reception in the Crescent Club at the Rosewood Crescent Hotel, Dallas. This warm and inviting space called for intimacy at the tables. At time for friends and family. So the florals were kept low so guests could chat with each other and the candles were abundant. 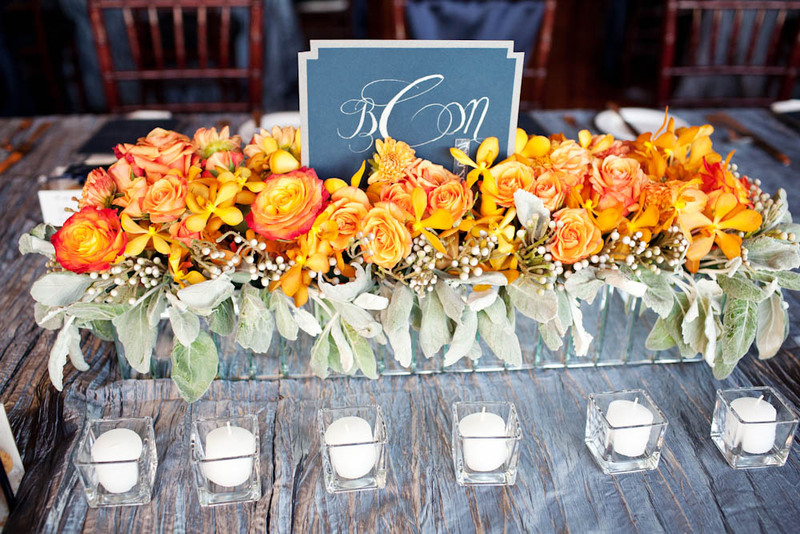 This “table number” for the head table was actually the couples new monogram. Such a fun idea. And really looks nice in a ballroom wedding. 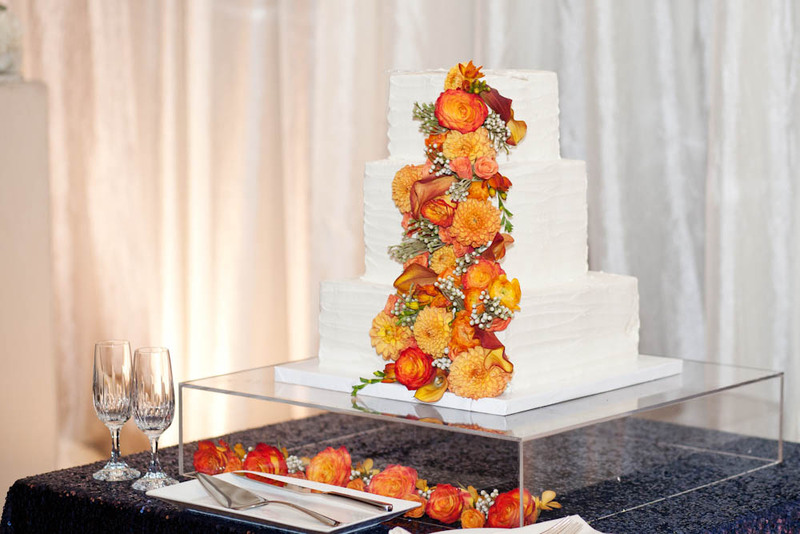 Floral by Bella Flora Dallas. 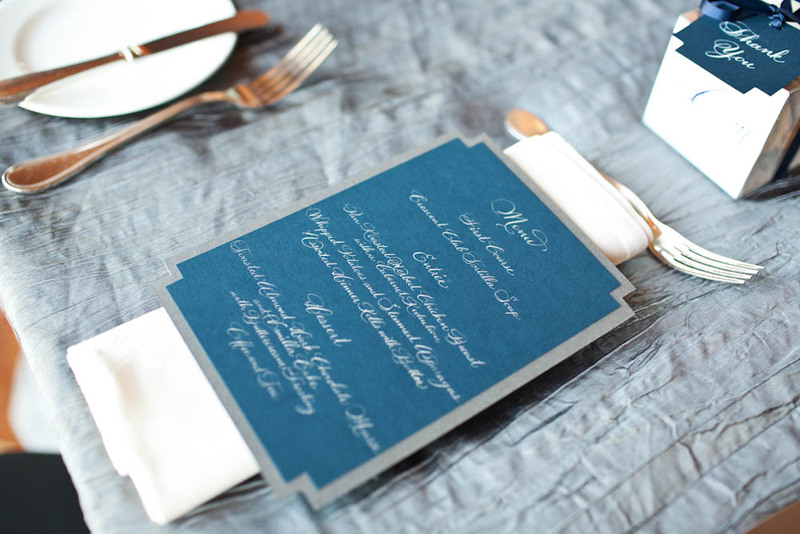 All the menus were original hand calligraphy in silver ink on blue paper. 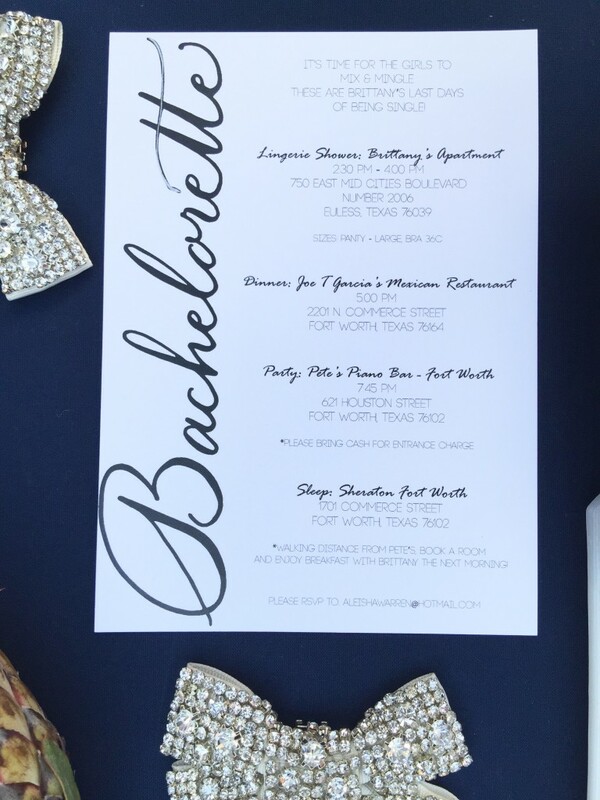 The corner notches carried the details from the invitation over. We used my zanner hand for all the calligraphy details. All photos by Perez Photography. Next up to share are my sisters wedding invitations. We letterpress printed these in blue ink using my zanner hand. They were the classic folded style with a fun architectural detail on the outside. Soft cotton paper was used to get a nice impression. 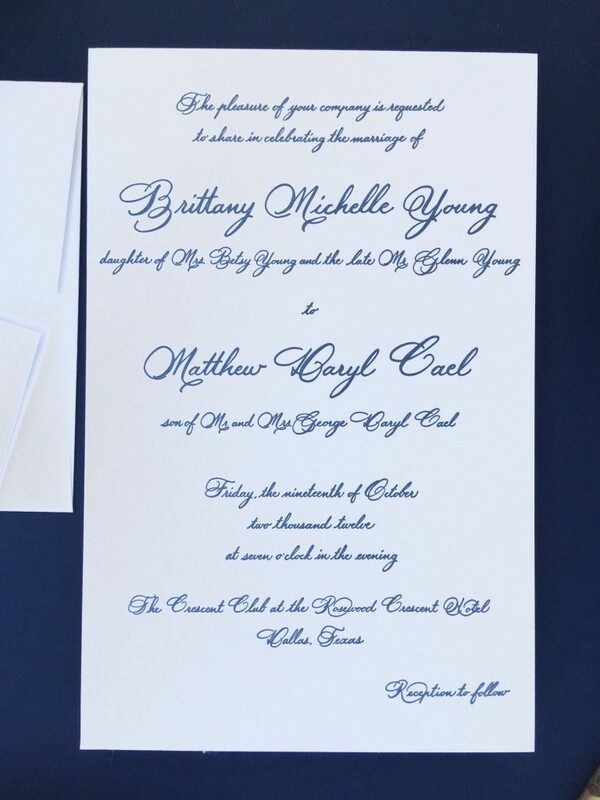 She also chose the most traditional folded invitation style. I think just to decorate the cover with a Greek key design. This design played into other wedding stationery at the reception. 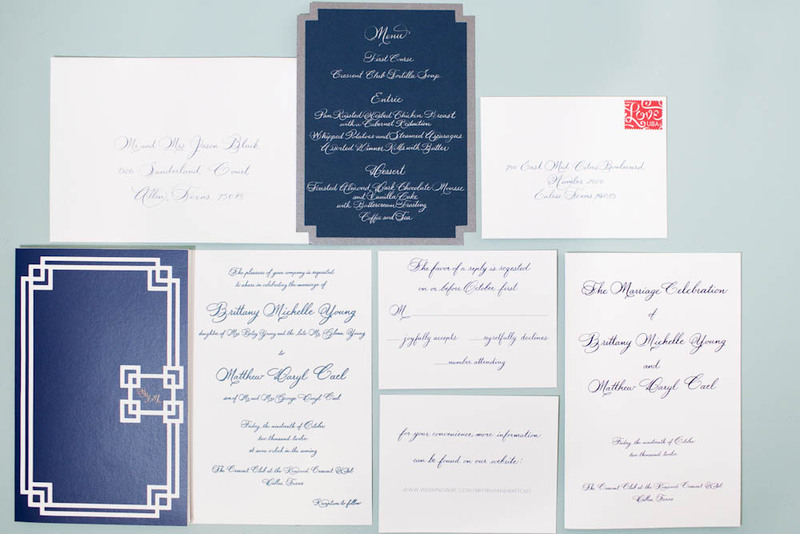 I also completed really lovely calligraphy envelope addressing in a matching blue ink to the wedding invitations and my zanner hand. This set featured a 2 line return address on the back flap. The front was completed in a centered layout with a 4th line zip code. 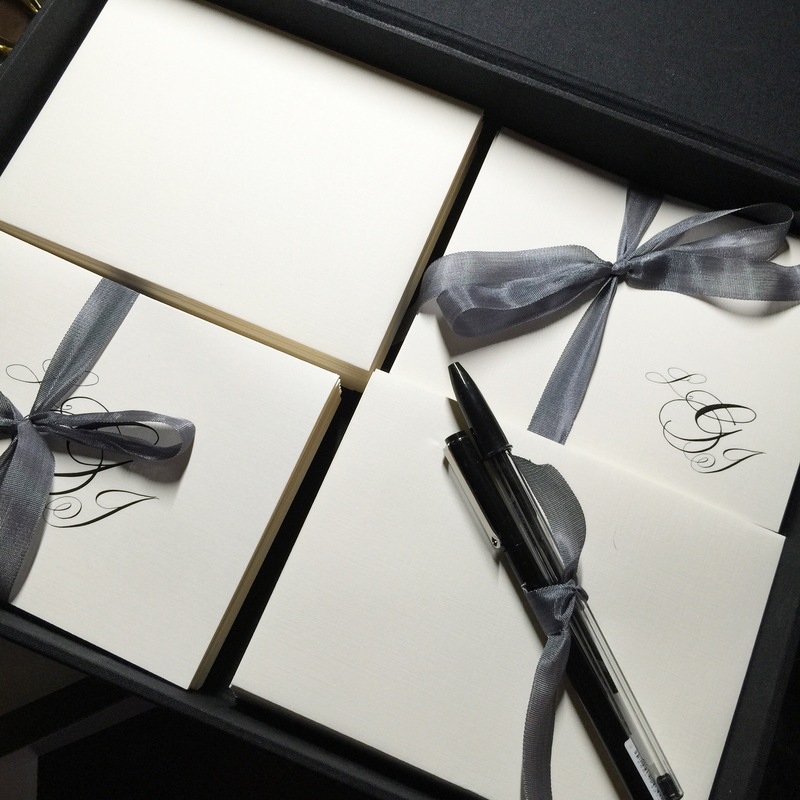 I like this classic look and dropping the zip code adds some writing space to the larger envelopes. Happy Anniversary to my little sister and her Dallas ballroom wedding! 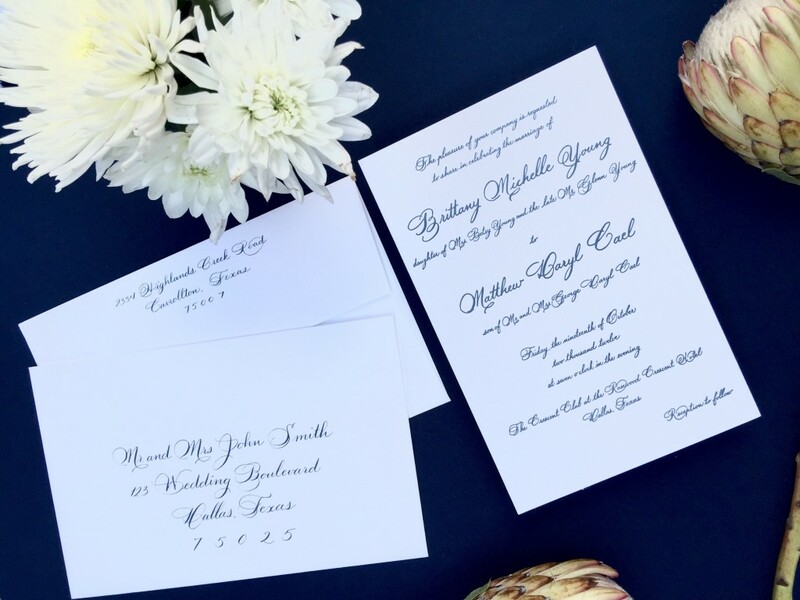 Since I have yet to share the photos and all her beautiful stationery, I thought this week would be the perfect time to show off all her gorgeous details. First up! 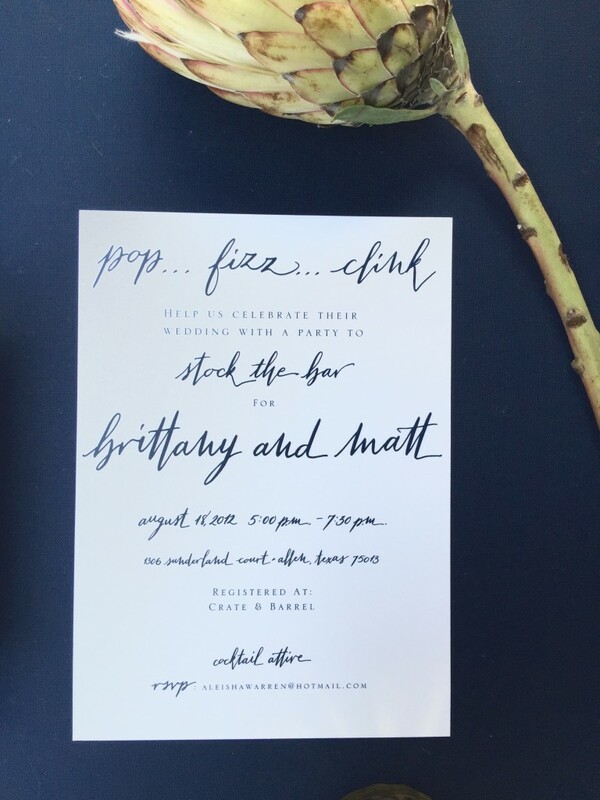 The save the dates and pre-party invitations! 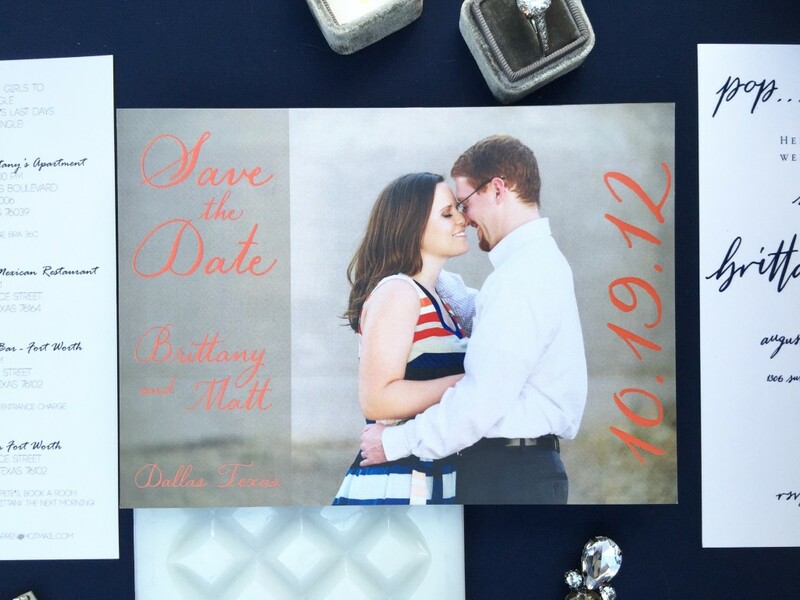 We used the Dylan hand paired with an engagement photo and created some colorful save the dates! Then we had a couples wedding shower to stock the bar. This one was fun in my mitty hand to make it really modern and young feeling. Finally, We had to have a bachelorette invitation. The main word was in my Dylan hand with a little silver added for some sparkle. 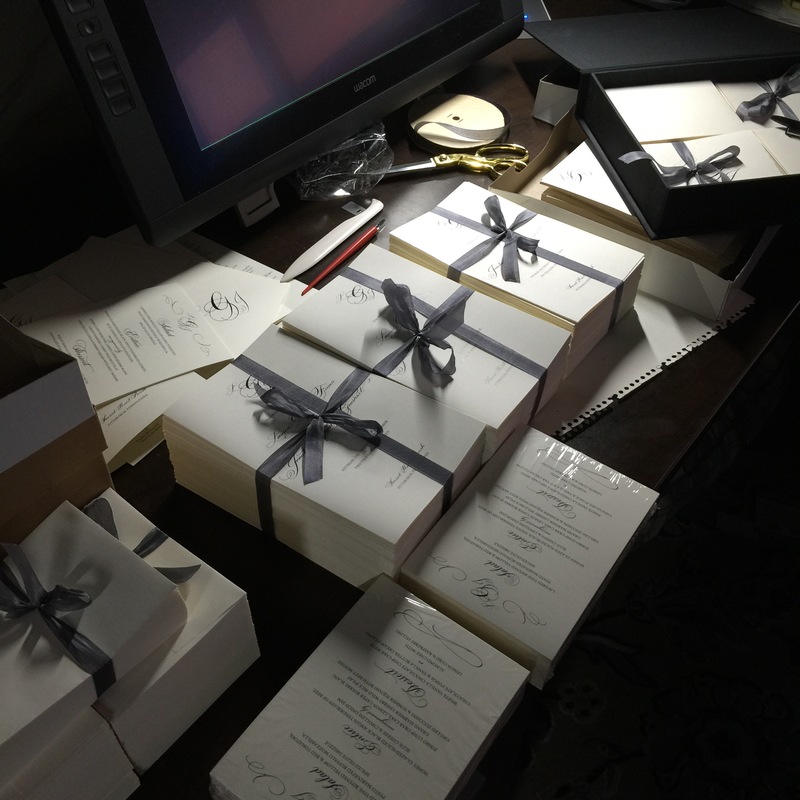 The envelopes were black with silver lettering and confetti was put in the envelope so it was a party ready to be opened. The schedule of events was included as well so all the girls invited could make appropriate plans.